India reclaimed its world’s top gold consumer crown from China as demand for jewellery surged almost 60% in the third quarter of the year, fresh data from the World Gold Council (WGC) shows. Global demand, however, fell to its lowest in nearly five years as Chinese buying slid by a third and gold jewellery, the biggest single area of consumption, dropped 4% to 534 tonnes. Overall, the south Asian nation —which had lost his position as the world’s No.1 gold consumer to China in 2011—bought 39% more gold in the run-up to Diwali and the start of the traditional wedding season. The WGC said that a weakening of gold prices in rupee terms had boosted demand in India, and that confidence in the new government led by Narendra Modi had also contributed to the rise. The increase in Indian purchases is more marked because demand for gold in the same period in 2013 was particularly weak, due to government restrictions on gold imports designed to limit the country's current account deficit. “It is now beyond debate that import restrictions have had little impact on the demand for gold and yet have strengthened the unauthorized supply channels,” according to WGC India’s Managing Director P.R. Somasundaram. Gold smuggling into India has skyrocketed since the government ratcheted up restrictions and taxes on legitimate imports of the precious metal. According to the council, about 200 tons of gold came through unofficial route last year and a similar quantity is also expected this year. WGC Managing director of investment strategy Marcus Grubb noted the fiures for India and China this quarter reinforce the need to understand the factors which underpinned an "exceptional Q3" last year. "People around the world buy gold for different reasons at different times, reinforcing the unique self balancing nature of the gold market. With recycling at a seven year low and mine supply looking increasingly likely to be constrained in the future the outlook for physical gold demand remains strong,” he said in today's statement. · Jewellery remains the biggest component of gold demand, representing more than half of all demand at 534t, which is 4% lower year on year. 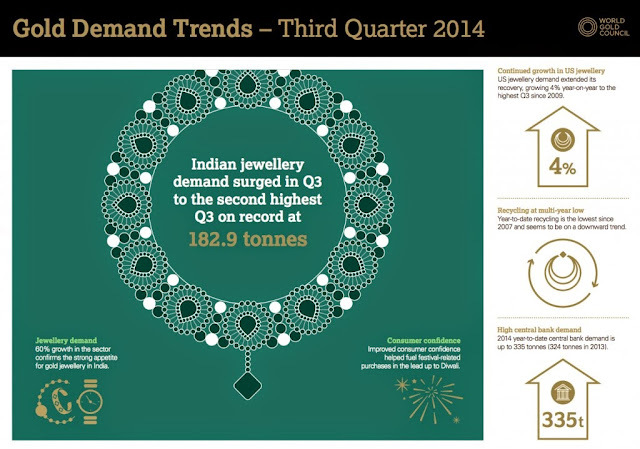 Jewellery demand was driven by India, which increased 60% to 183t. UK and US demand was also strong. Chinese jewellery demand fell 39% to 147t as the jewellery market caught its breath after an exceptional year for demand last year. · Central banks bought 93t of gold in Q3 2014, 9% lower year on year, but the 15thconsecutive quarter that banks were net purchasers of gold. · Investment demand (bars and coins and ETFs) was up 6% to 204t. However, there was a 21% fall in bar and coin demand from 312t to 246t following unprecedented levels of demand last year. ETF outflows stood at 41t compared to 120t in the same period last year. · Technology demand was 98t, 5% lower than a year ago as the industry continued its shift towards alternative materials in technological applications. 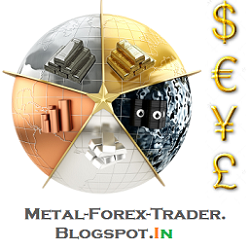 · Total supply fell by 7% year on year to 1,048t. Mine production was up slightly 1% to 812t, but recycling of gold continued to abate, declining 25% year on year to 250t, and on a year to date basis is the lowest level since 2007.